As usual, click on the image for a larger ad. In the early 50s, the movie industry was scared to death of television and tried to come up with ways to offer things that TV couldn't do. That included better sound, 3-D, and wide aspect ratios. Up to this point, movies were typically filmed in a 4:3 aspect ratio: 4 inches wide to every 3 inches high, which is nearly square. In order to get wide screen, there were two methods. One method was to take multiple cameras, aimed so that each covered a certain area, and syched together so the film matched up. That was technologically difficult and no matter how well it was done, there was still a line where the images matched up. The other way used an anamorphic lens, which means that it horizontally compressed the image: everything looked tall and very thin on film. But if you projected the image back through an anamorphic lens, the image would be decompressed and looked normal. The result was you could shoot a very wide shot and record it on normal film; all you needed were matched anamorphic lenses on your camera and projector. 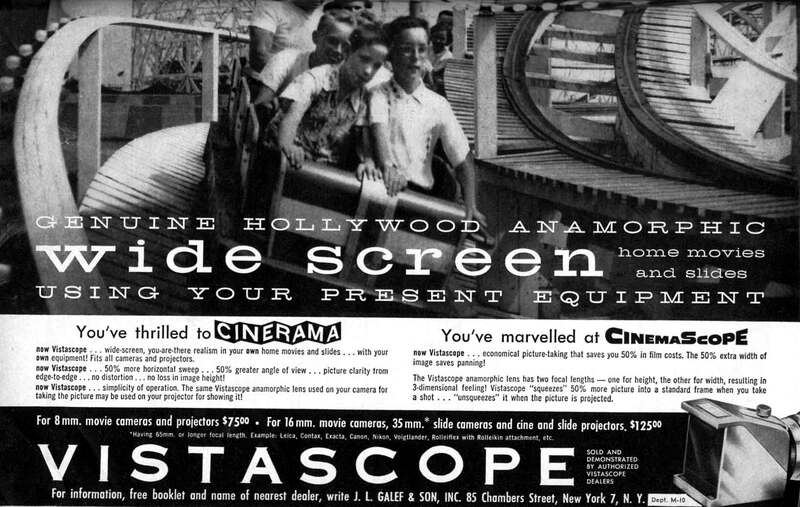 Vistascope attached to 8mm and 16mm movie lenses for taking, then you'd pop it on your projector for viewing, and voila—you had the big screen experience at home. I always wanted to try this with my 35mm still camera and my enlarger, but never found a lens I could afford.